“The first step to combating Isis is to understand it. We have yet to do so. That failure costs us dear.” (Anthropologist, Scott Atran). The murder of 85-year-old parish priest, Father Jacques Hamel during morning mass in Saint-Etienne-du-Rouvray, northwest of Paris, by two adherents to the religious-based cult ISIS was yet another illustration of not only the depravity that this cult represents, but of the failure of domestic and international strategy of governments to deal with them. The lesson from almost a decade and a half of fighting terror with bombs is that the strategy has been an epic failure. After the mass killings by ISIS in Paris, each subsequent attack on French soil has been marked by familiar-sounding televised addresses of condemnation of the perpetrators by president, Hollande followed by a determination to defeat them militarily. Meanwhile, French foreign policy in the Middle East continues along the same trajectory, presumably based on the premise that only through fighting fire with fire will the war against ISIS be won. However, it would appear that with the exception of world leaders like Hollande and Britain’s Theresa May, most rational thinking people believe this eventuality to be an unrealistic proposition. ISIS are not like a traditional army and therefore can’t be fought as though they are one. Indeed, it’s the unpredictability and the random nature of their attacks in an era of globalisation which transcend the limitations associated with the traditional armies embedded within the structure of the nation-state, that sets them apart. Although repeating the same failed foreign policy objectives undertaken by state actors in order to address the threat posed by an international terror network and ‘lone-wolf’ killers may be regarded as a sign of insanity by most, it nevertheless doesn’t appear to deter those who are motivated by the need to satisfy the financial interests of the lobbyists who profit from war. Although it is widely understood that bombs and drones are counterproductive, it’s perhaps less understood that the establishment appear to want it that way on the basis, it would seem, that terrorist retaliation justifies the further use of bombs and drones. Ken Livingstone was surely correct in his analysis on BBCs Question Time programme last November when he suggested that bombing Raqqa will play into the hands of ISIS from a propaganda perspective enabling them to bolster their number of recruits on the back of it. Indeed, it is clear that the aim of the religious-based cultists is to provoke an international bombing campaign precisely in order to achieve this objective. The ‘strategy’ of indiscriminate bombing of transnational ‘targets’ as a means of ending the cycle of terrorism and counter-terrorism is a policy of despair. What is needed is a total rethink that involves, in the first instance, a serious attempt at addressing the ideological motivations that drive ISIS as an organisation as well as the reasons why mainly young people are driven into the hands of this murderous cult. The motivations seem to be varied and complex, embracing historical, theological, psychological and ideological factors. The first of these relates to the injustices meted out to the people of the region by the imperial powers. These injustices primarily originate from a series of secret meetings during World War 1 in London and Paris between the French diplomat, François Georges-Picot and the British politician, Sir Mark Sykes. During these meetings, straight lines were drawn on a map of the middle east intended to effectively outline the control of land that was to be divided between the two countries. The French were to get Syria, Lebanon and parts of northern Iraq, while the British decided on southern Iraq, Jordan and Palestine. The idea was that instead of giving independence to the Arabs which was promised following the collapse of the Ottoman Empire, the imperial powers would run them on their behalf. The ensuing chaos has largely stemmed from this agreement. What drives ISIS is their need to fill power vacuums in a post-colonial world in which the artificial imperial borders created by Sykes-Picot are collapsing. Robert Fisk made the astute point that the first video ISIS produced was of a bulldozer destroying the border between Syria and Iraq. The camera panned down to a piece of paper with the words “End of Sykes-Picot” written on it. The wider “Arab Awakening,” as Fisk puts it, represents a rejection of the history of the region since Sykes-Picot during which time the Arabs have been denied freedom, dignity and justice. According to Fisk, ISIS is a weapon that’s not primarily aimed at the West but at the Shia which the Sunni Gulf States’ want to keep at bay. This explains why the funding for ISIS is principally coming from the Sunni states’ of Saudi Arabia and Qatar. The possibility of closer U.S-Iranian ties in the future will likely result in pressure being put on these states’ to ‘switch off’ their funding to ISIS which Fisk claims was one of the main topics of discussion at the Geneva nuclear talks between the two countries. A couple of months ago, the goal of ISIS was to maintain the Caliphate, but they now realize that this objective is in jeopardy. Consequently they are attempting to re-organise. This involves them reverting back to a guerilla-style organisational structure. The purpose of directly commanded attacks, is to prove to their followers throughout the world that despite the set-backs described, they still remain a strong fighting force. Atran posits that the appeal of ISIS seems to be their offering of a Utopian society and the sense of belonging and empowerment that the religious obscurantists claim is lacking in Western society. The narrative is a future of peace and harmony, at least, under their interpretation, but with the recognition that brutality is also needed to get there. The underlying aspect of this Utopianism is the retreat from the kind of unconditional freedom where many young people feel pressured into certain social actions, towards a different kind of freedom free from ambiguity and ambivalence that, for those concerned, enhances a form of creativity that restraint helps nurture. ISIS exploits this dichotomy by outlining a way towards significance in a society that treats the alienated as insignificant. Maajid Nawaz depicts ISIS as akin to a brand that in order to be defeated needs to be discredited as part of a long-term strategy. This involves the creation of alternative narratives and the engendering of alternative forms of belonging and identity. Nawaz argues that the mission statement, as part of a generational struggle, has to be that the kind of obscurantist ideology that ISIS adhere to, is made as un-appealing as Stalinism or Hitler fascism is today. “We’ve got to be careful that we don’t become fixated about destroying the organization itself as part of a long-term strategy, but rather to focus on destroying the ISIS brand”, he says. This approach will surely need to be run alongside a recognition by Western governments that their foreign policy strategies are not working. Instead of spending billions on ineffectual and counterproductive war, the money would be far better spent on effective prevention programmes on the ground. This could involve, as middle east scholar Ed Husain has argued, employing former jihadists to reach out to help educate young people about the dangers of ISIS and other extremists. At some point, channels of communication will have to be opened up with radical Muslim groups who are willing to engage with experts outside the Muslim world to come to some kind of compromise agreement. This might even involve the formation of an Caliphate-type enclave based on ISIS lines. What is certain is the current path we are on is the wrong one. The lack of any meaningful attempt to implement an effective strategy to weaken or destroy radical Islamism is self-evident. Ideologies cannot be defeated by bombs. Any U.S insistence that it’s dictatorial regional allies and proxies – Saudi Arabia and Qatar – deplete ISIS of funds, will go a long way to achieving desired short-term goals. The West might have to come to terms with making a short-term pact with the devil as part of a long-term strategy that undercuts the kind of psychological and ideological motivations that drive young people into the arms of religious obscurantists in the first place. The decision of the UK government yesterday evening (December 2) to extend its war on terror into Syria with no coordinated strategy in place to defeat ISIS, will almost certainly be as catastrophic as Tony Blair’s decision in 2003 to commit British troops to Iraq. The notion that MPs could have genuinely been persuaded by Cameron’s line of reasoning for another illegal war is as inconceivable as MPs during Blair’s reign being unaware of either Scott Ritter’s findings stating that by 1998 Saddam had effectively been disarmed, or the subsequent public pronouncements of Colin Powell and Condaleeza Rice that were made on the back of them that preceded the infamous 45 minute claim. The Prime Minister’s justification for sending more of our troops into harms way – which, significantly, was rejected by the Foreign Affairs Committee – was predicated on the dubious and frankly laughable claim of the existence of 70,000 “moderate rebels”. On Sunday’s (November 29) edition of the BBCs Marr programme, Defence Secretary, Michael Fallon, when pressed by presenter Andrew Marr to clarify who these rebels were, replied that were comprised solely of anti-Assad, Free Syrian Army forces. 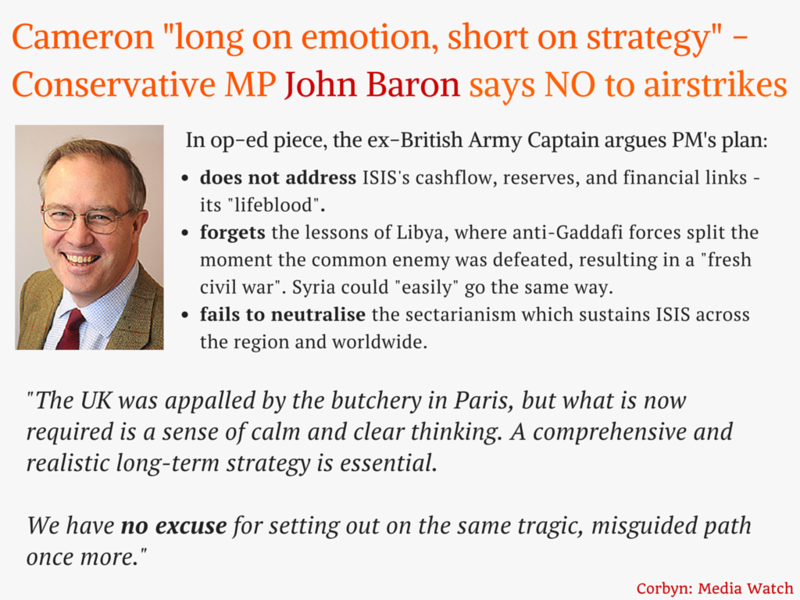 However, early on December 1, Lt Gen Gordon Messenger, the deputy chief of the defence staff, appeared to have contradicted Fallon by refusing to confirm whether any of the alleged 70,000 fighters were members of more extremist groups such as the Islamic Front and Ahrar al-Sham. The fact that no clarification by Cameron was given to MPs regarding the source for the 70,000 figure or its composition, is not a sufficient enough basis for MPs to be able to make an informed decision about such an important life and death issue. A major argument of those who defend the decision to extend the war, is premised on the claim that the attacks against ISIS in Iraq have not resulted in a single civilian casualty. Numerous conservative MPs have been afforded air time in the media to pontificate such an absurd claim without, to my knowledge, any serious challenge from journalists contradicting it. In under ten minutes of researching credible civilian casualty figures in Iraq resulting from coalition bombs, I learned that eight named children and two women had been killed in just one strike on Fallujah in a single day on November 26. The public are being denied critical information by the mainstream media in order for them to be able to counter government propaganda and thus to challenge their MPs about their decisions for the case for war. But the same cannot be said of these MPs who themselves ought to be seeking to challenge such fundamental misconceptions and misinformation. Feigned ignorance is not a defence against complicit hands metaphorically covered in the blood of innocent victims. The use of the government’s “precision” Brimstone missiles that will kill many more innocent men, women and children than the tragedy of Paris that gave rise to their use in Iraq and now Syria, will be the direct consequence of the deceptions of politicians’ and the shortcomings of journalists who failed to challenge their rationale for war. If the government were serious about obliterating the existential threat they claim ISIS represents, then they would not be aligning themselves with allegedly 70,000 unidentified “moderates” who, as Patrick Cockburn contends “are weak or barely exist”. On the contrary, they would be aligning themselves with the forces on the ground that are resisting ISIS most effectively. These groups, as Peter Hitchens acknowledges, are the Syrian Kurds, the Syrian National Army, Hezzbollah and Iran – all of whom are being backed by Russian air power. However, this sensible coordinated strategy is being usurped by Cameron’s non-existent one, upon which, in their infinite wisdom, the majority of MPs voted. The second explanation as to why the government’s decision to extend the bombing into Syria is not motivated by the need to destroy ISIS, is the duplicitous approach they have adopted in respect to their dictatorial regional allies in the Gulf peninsula who are among their biggest recipients of weapon deals. There is evidence that powerful actors within Saudi Arabia and Qatar, who are among the most brutal regimes on earth, have been facilitating funds and arms to ISIS and their affiliates that result from these deals. Consequently, figures suggest ISIS alone has at least 80,000 fighters up from last year’s estimates of around 20,000 to 31,500. No matter how this is spun, the situation can only be interpreted as being an example of state sponsored terrorism that has had serious blow-back consequences. A former US military chief goes as far as to admit that the Iraq invasion had spawned ISIS. Nafeez Ahmed notes that in his testimony before the Senate Armed Services Committee in September 2014, General Martin Dempsey, then chairman of the US Joint Chiefs of Staff, was asked by Senator Lindsay Graham whether he knew of “any major Arab ally that embraces ISIL”? Dempsey replied: “I know major Arab allies who fund them.” In other words, the most senior US military official at the time had confirmed that ISIS was being funded by the very same “major Arab allies” that had just joined the US-led anti-ISIS coalition. Naturally, both Russia and its allies on the one hand, and the U.S and its allies on the other, have geopolitical interests’ diametrically opposed to one another. But the point is, Russia’s principle motivation leads them to destroying ISIS with the view to maintaining Assad’s grip on power, whereas the West’s motivation lies elsewhere. The West have spent well over $5 trillion on waging their “war on terror”. Over that period, US State Department data shows that terror attacks have skyrocketed by 6,500 percent, while the number of casualties from terror attacks has increased by 4,500 percent. Under such circumstances, it might well be reasonably argued, as former UK ambassador to Syria, Peter Ford has, that Cameron’s warmongering deceit is criminally negligent. It’s absurd to argue that the way to thwart transnational terrorism committed by organised groups of individuals on European soil is to bomb innocent people in nation states’ in the middle east. The truth is, the general public are, as was the case with Iraq, being systematically lied to. After numerous hours of debate in parliament, it is clear that Cameron’s case for bombing that will now begin within hours of this article being published, had not been made. The decision by the British parliament to ostensibly bomb ISIS by an overwhelming parliamentary majority of 174, is not supported by the majority of the British people and is based on a charade whose real purpose is illegal regime change. The psychology of ISIS and how to combat them. The lesson from almost a decade and a half of fighting terror with bombs is that the strategy has been an epic failure. And yet the UK government under the leadership of David Cameron seems intent on repeating the misguided foreign policy in Iraq in relation to dealing with ISIS in Syria presumably on the basis that the result will be different even though there is no evidence for this. Doing the same thing over and over again and expecting a different result may be a sign of insanity for most, but not, apparently, if you happen to be motivated by the need to satisfy the financial interests of the lobbyists who profit from war. Although it is widely understood that bombs and drones are counterproductive, it’s perhaps less understood that the establishment appear to want it that way on the basis, it would seem, that terrorist retaliation justifies the further use of bombs and drones. Ken Livingstone was surely correct in his analysis on BBCs Question Time programme last Thursday (November 26), when he suggested that bombing Raqqa will play into the hands of ISIS from a propaganda perspective enabling them to bolster their number of recruits on the back of it. Indeed, it is clear that the aim of the extremists is to provoke an international bombing campaign precisely in order to achieve this objective. The “strategy” of indiscriminate bombing of transnational “targets” as a means to ending the cycle of terrorism and counter-terrorism is a policy of despair. What is needed is a total rethink that involves, in the first instance, a serious attempt at addressing the causes that include the historical injustices meted out to the people of the region by the imperial powers. These injustices primarily stem from a series of secret meetings during World War 1 in London and Paris between the French diplomat, François Georges-Picot and the British politician, Sir Mark Sykes. During these meetings, straight lines were drawn on a map of the middle east intended to effectively outline the control of land that was to be divided between the two countries. The French were to get Syria, Lebanon and parts of northern Iraq, while the British decided on southern Iraq, Jordan and Palestine. The idea was that instead of giving independence to the Arabs which was promised following the collapse of the Ottoman Empire, the imperial powers would run them on their behalf. The ensuing chaos over the next century stemmed from this agreement. ISIS is essentially motivated by power in a post-colonial world in which the artificial imperial borders created by Sykes-Picot are collapsing. Robert Fisk points out that the first video ISIS produced was of a bulldozer destroying the border between Syria and Iraq. The camera panned down to a piece of paper with the words “End of Sykes-Picot” written on it. The wider “Arab Awakening,” as Fisk puts it, represents a rejection of the history of the region since Sykes-Picot during which time the Arabs have been denied freedom, dignity and justice. According to Fisk, ISIS is a weapon that’s not primarily aimed at the West but at the Shia which the Sunni Gulf States’ want to keep at bay. This explains why the funding for ISIS is principally coming from the Sunni states’ of Saudi Arabia and Qatar. The possibility of closer U.S-Iranian ties in the future will likely result in pressure being put on these states’ to ‘switch off’ their funding to ISIS which Fisk claims was one of the main topics of discussion at the Geneva nuclear talks between the two countries. Atran posits that the appeal of ISIS seems to be their offering of a Utopian society and the sense of belonging and empowerment that they claim is lacking in Western society. The narrative is a future of peace and harmony, at least, under their interpretation, but with the recognition that brutality is also needed to get there. The underlying aspect of this Utopianism is the retreat from the kind of unconditional freedom where many young people feel pressured into certain social actions, towards a different kind of freedom free from ambiguity and ambivalence that, for those concerned, enhances a form of creativity that restraint helps nurture. ISIS exploits this dichotomy by outlining a way towards significance in a society that treats the alienated as insignificant. It seems to me that the most effective way to counter ISIS propaganda is for governments’ to remove the “pull factors” of ISIS by giving young people a sense of hope for the future, offering them more of the “carrot” of opportunity instead of just the “stick” of despair. One of the major problems is that there is not the same kind of government investment in prevention by way of guidance and decision making channels that are relevant to young people to avoid them becoming alienated enough to want to seek out ISIS. It seems to me that this is where ISIS have the upper hand, evidenced by the fact that they spend countless hours and cash luring people in. Instead of spending billions on ineffectual war, the money would be far better spent on effective prevention programmes on the ground. This could involve, as middle east scholar Ed Husain has argued, employing former jihadists to reach out to help educate young people about the dangers of ISIS and other extremists. At some point, channels of communication will have to be opened up with radical Muslim groups who are willing to engage with experts outside the Muslim world to come to some kind of agreement that might even involve the formation of an enclave based on ISIS lines. What is certain is the current path we are on is the wrong one in terms of the lack of any meaningful attempt to implement any effective strategy to weaken or destroy radical Islamism. Ideologies cannot be defeated by bombs, although the strategic use of broader coalition forces on the ground allied with a serious attempt by the U.S to insist that it’s dictatorial regional allies – Saudi Arabia and Qatar – deplete ISIS of funds, will go a long way to achieving the desired outcome. In order to defeat Hitler, Churchill was prepared to make a pact with the devil. The West might have to come to terms in doing the same with ISIS. Representative democracy is bad for parliamentary democracy because it implies the shifting of power from the elite towards the masses. People power has the potential to tear down the ivory towers of privilege that the rich construct for themselves which is why the establishment is fearful of such an eventuality. The extent to which a political system that functions to support the lifestyles and privileges of the elite ensconced within these towers is determined by the level of passivity and apathy of those on the outside. Due to the UK’s appalling electoral system, a right wing government in the UK exercise absolute power with just 24.4 percent of those eligible to vote. The attitudes of many of the 38% who did not vote at all in the last general election towards the entire political class, was a combination of indifference, passivity and apoplexy. Many others who were politically active and mobilized were nevertheless resigned to the fact that the deeply corrupt and flawed ‘winner takes all’ system does not give them a political voice within parliament. The end result of the combination of all these factors, is a system that’s corrupt and rotten to the core. Although the government’s legality cannot be called into question, it’s legitimacy most certainly can. A government’s legitimacy rests on the popular consent of the governed. It’s clear that the Tories austerity measures that consist of deepening and widespread cuts will do far more harm to far more than the 24.4 per cent of the population that supported the government during the last election. To that extent, there are valid questions to be asked about what right the conservative government has to rule. On the one hand, we have the King and Princes (the government). On the other, the commoners. The commoners may petition and the nobility must respond to maintain order… Real participation of “society” in government is nowhere discussed, nor can there be any question of democratic control of the basic economic institutions that determine the character of social life while dominating the state as well, by virtue of their overwhelming power. Chomsky was actually referring to a 1975 Trilateral Commission report about the nature of American democracy by author Samuel Huntington, but he might as well of been discussing the UK political system of governance in 2015. Political ‘outsiders’ like Jeremy Corbyn and the newly appointed, Ken Livingstone, are regarded as a threat to the narrow careerist interests of not only the Blairite political elite within the Parliamentary Labout Party, but also the metropolitan London media elite of ‘insiders’ who sing to the Blairite-Tory tune. One question arises from Sylvester’s piece. How can an attack by the mainstream media on an authentic voice of Labour values possibly be regarded as the ultimate threat to Labour values? An example of this mode was Kuenssberg’s token gesture during the Corbyn interview in which she used the phrase “some voters may think…” which was clearly intended to give the impression of balance as a means of offsetting her aggressive line of questioning in response to Corbyn’s reasonable commitment to the spreading of international law that preceded it. The impression given is that we live in a free and open society where genuine dissent is tolerated. “The second, ‘full propaganda’, mode involves straight forward, no holds barred bias. This is seen in time of war, on royal occasions, on the anniversary of great military victories, and at times when leaders pass away. Andrew Neil’s impassioned eulogy during the opening sequence of the BBCs flagship political discussion programme, This Week broadcast on November 19 is an example of the second, “full propaganda” mode. Neil’s linking of the nuclear power state to a succession of great French thinkers was his way of showing support for Hollande’s foray into bombing its former colony. Neil’s “inaccurate nonsense in the form of nice memorable words strung together with angry sad words” was critiqued in a brilliant piece of polemical writing by Frankie Boyle. What both Boyle’s article and the Medialen’s analysis highlight, is that parliamentary democracy in the absence of a democratic media creates the illusion of popular consent while enhancing the power of the state and the privileged interests protected by it. The one that wins is the one that is fed. Democracy is that way. The wolf that wins is the one we feed. And media provides the fodder.